Laumène has been struggling for a long time. 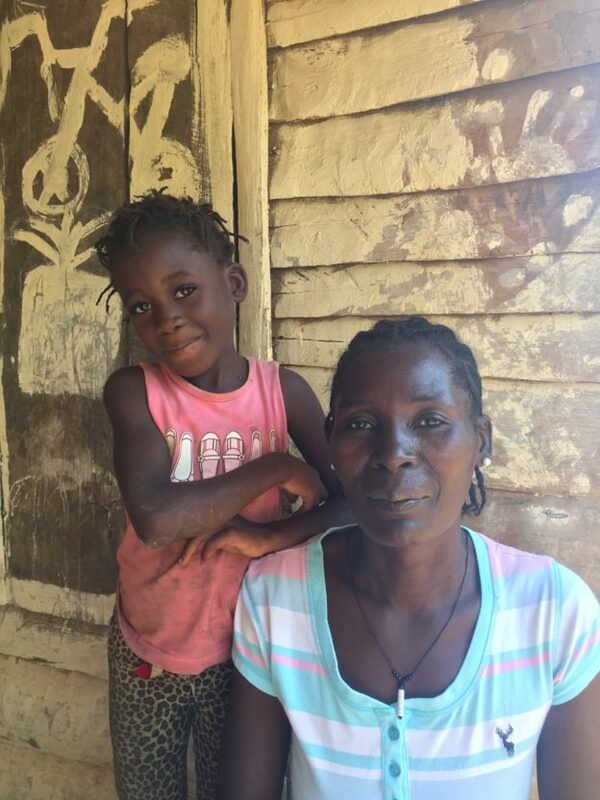 She and her first husband lived with their two kids just up the mountain from where she lives now, but poverty drove the man to leave for the Dominican Republic to try to earn a living. Not long after he left, she heard that he had been killed by a gang of livestock thieves. She and her children moved in with her parents when her late husband’s siblings drove her off the family’s land. She stayed with her parents until she became partner of a man who already had a wife. He built a shack for her on a corner of his land, and that is where the home she built with the CLM program’s support now stands. She had more children with this second man, but as his secondary wife, she could never count on his full support. When it was time to graduate, he was not the one she invited to enjoy the celebration with her. Instead, she asked her daughter to come from Port au Prince. The younger woman came in the role of her mother’s godmother, appearing at the celebration with a graduation gift in hand, her one duty as godmother. In many ways, she flourished as part of the program. She is especially happy about her new home. Completing it was, she says, the most difficult challenge that the program put before her, but also the most important. Having a home is like have a bank account. “It is,” she explains, “what provides whatever else you need.” She could never have nice things because rain would ruin anything she tried to keep in her house. Since she finished building her home, however, she added the touches she always wanted: a table, tablecloths, and curtains. She now feels really comfortable for the first time. When she talks about the progress she’s made in the program, she talks about more than her new home. “Now I have chickens, ducks, turkeys, and goats in my front yard.” And her pig just had piglets. She’d like to take another step forward and buy a cow. She thinks she can afford one. But she’s cautious. She’s heard rumors that there are neighbors jealous of her progress. She’s heard that they say they’ll poison a cow if she buys one. So, she’s holding off for now. She’s been talking with one neighbor, another successful CLM member who’s facing the same problem, and they are trying to figure something out. But beyond her home and her livestock, she talks about having money when she needs it. “When you have money, you are close to anywhere you want to go.” She had to sell off one of her goats to pay the last installment of the loan she took out from her Village Savings and Loan Association. She had borrowed the money to finish work on her house and pay a balance she owed to her children’s school. But she chose a goat that had been refusing to nurse its young. It had little long-term value for her. And she had money left over after the sale to invest in her farming.